After Stephen graduated from high school and started college, he wanted to find a job that could fit into his schedule. To get Stephen started, his Division of Vocation Rehabilitation (DVR) counselor referred him to Goodwill’s Workforce Development team through the Alternative Workforce Supplier Program (AWSP), a unique employment partnership with the largest e-commerce sortation facility in Kenosha. Stephen began this position in November 2017 and with the support of job coaches, and he continues to work hard and still shows a positive attitude. 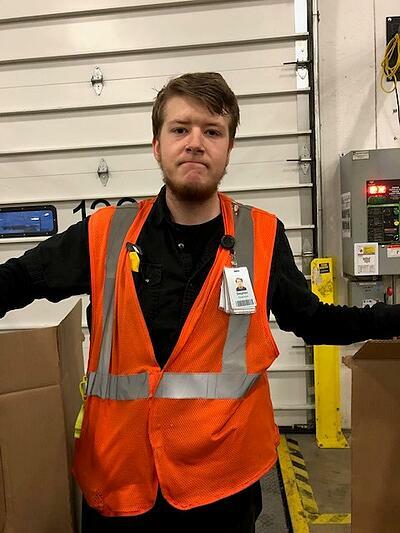 He has consistently exhibited a willingness to grow and develop in his role as a sortation associate. When he first started, he took the steps needed to improve his scan rate, increase his involvement in job responsibilities, and went above and beyond his day-to-day duties to help other participants of the AWSP program. In fact, his scan rate improved in one month from 158 units per hour (UPH) to 163.3 UPH! He did this by demonstrating a greater understanding of the pace needed on various work areas, such as the pallet jack army and small sort. Stephen could quickly and independently identify all the requirements for each area of work at the facility. Managers have said, that Stephen is awesome! He constantly moves to the work and does a great job. He is a hard worker, friendly and responsible. He is a model employee. Lastly, Stephen has always been eager to help other new associates, modeling how to move with a purpose to get the work done! Stephen continues to improve and help others achieve in the workplace all while exhibiting a strong work ethic and receiving multiple certifications. Stephen says, “My favorite part of the program is all the training I got from Goodwill. They also helped me to make friends with the managers, especially Jaime and Josh. I liked learning how to be a good employee by moving fast, using my time wisely and moving heavy boxes!